See Spots spin: In recent years, Jupiter has picked up a couple new red spots. While the Great Red Spot (right) has raged for hundreds of years, newer smaller red spots -- Red Spot, Jr., (middle) and "Baby Spot" (left) have emerged.Courtesy M. Wong and I. de Pater (University of California, Berkeley)New images from the Hubble Telescope show that the Giant Planet has picked up a couple more red spots, smaller but very near to the Great Red Spot. Images taken earlier this month discovered the third red spot on the planet, which has been nicknamed “Baby spot.” Red Spot, Jr., was discovered in spring 2006. The Great Red Spot, which is a raging storm about the same size as our Earth, has been churning in Jupiter’s atmosphere for 200 to 350 years. “Baby Spot” had been a white storm prior to taking on its reddish appearance. Scientists believe the red color come from clouds reacting to solar ultraviolet radiation. 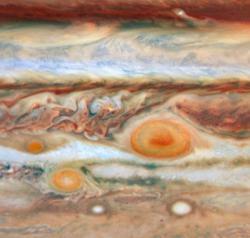 Why is Jupiter getting a surge of extra red spots? Researchers think that it has to do with climate changes on the planet. In 2004 a California astronomer predicted that the planet was moving into a phase of warming temperatures that would destabilize its atmosphere. “Baby Spot” is on a collision course with the Great Red Spot and could be gobbled up by it later this summer or bounced into a different location on the planet. thats amazing but what does it have to do with Al gore, the climate change? You may embed videos from the following providers vimeo, youtube. Just add the video URL to your textarea in the place where you would like the video to appear, i.e. http://www.youtube.com/watch?v=pw0jmvdh. Should ancient artifacts return home? Great White Squirrels: Are they albinos? Connect with Science Buzz on Facebook and Twitter. You can also subscribe to our RSS feed using any newsreader software.